The National hydroelectric power company in India announced that they are going to construct a great solar power plant that will sail on top of a lake. India has previously announced their strategy to build a 10 megawatt solar situated on some of the its canals, the Asian country took their idea to another level and want to construct a floating power station that will be situated on one of the large stretches of water in Kerala, India. This particular floating solar power plant machinery was expanded by India’s Renewable Energy College and it is going to be implemented by the National Hydro Power Corporation, India’s national energy company. The very first of its plants will be authorized this fall. “NHPC had contacted us for offering technical know-how and installation assistance for their proposed 50-mw plant,” reports the chairman of the Renewable Energy College, Gon Choudhury. “Each station would require around 3000 square feet of space to generate 20 kilowatt of power. There are many water bodies that could be used for this,” he added. This project looks a lot like one of Japan’s offshore solar power plants built in 2013. The 70MW Kagoshima Nanatsujima Mega Solar Power Plant was conceived as part of the move towards a more green energy area as a follow-up of the 2011 Fukushima meltdown and is located in Japan’s Kagoshima Prefecture. India is water shortage. 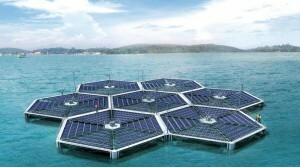 So Floating Solar Plant’s wonderful idea for India. And it’s very important to maintain effectively same direction and position on the water for floating solar plants. Because directional change of solar panels reduces electricity production. So floating solar plants also need the directional control mooring systems for their parked positions. Azimuth and position change of floating solar plants caused by wind, waves and external forces. Restoring Force Strengthened Mooring System for floating solar plants has been created in South Korea. This Mooring System generates Restoring Force immediately when floating solar plants are being rotated or moved on the water.